When you have multiple CCBoot servers for load balance, you can use the "Pause" function of CCBoot to do some maintenance for your server. An Internet Cafe has two servers "A" and "B", and two servers are already working as load balancing servers. When server"A" needs to be maintained. For example you have to replace the Server“A”’s write-back disk, but there are clients online and connected to the server,so closing down server "A" for maintenance is out of the question. At this point, we can use the CCBoot "Pause” services function to pause the server "A" all services. When services is paused in Server “A”,all booting clients will now boot from server "B". CCBoot "Pause" function lets clients boot from Server “B”, in a way it's like Server “A” is redirects boot request to Server “B”. Once Server “A” is paused, you can do maintenance on the "Server A", without affecting the entire business of your cafes. 1) In the CCBoot Main Interface toolbar click the "Pause" button (Figure 1-1). 2) "CCBoot" pop-up dialog box, click the "Yes" button to confirm “Pause” of services (see Figure 1-2). After completion of the above two steps. When the clients reboot or the new clients boot, it will start from Server B. 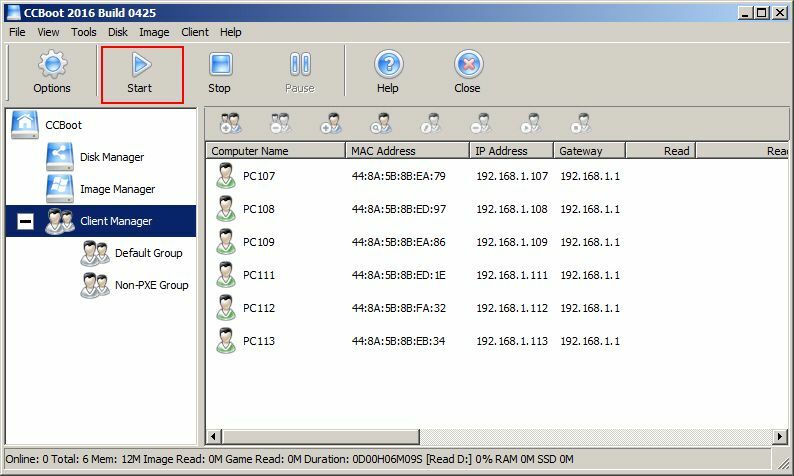 When there is no online client on Server A, you can maintain server A. After the Server maintenance is complete, click the "Start"button in the toolbar (Figure 1-3), after the client is restarted, server A and B will restore the original settings for load balancing.